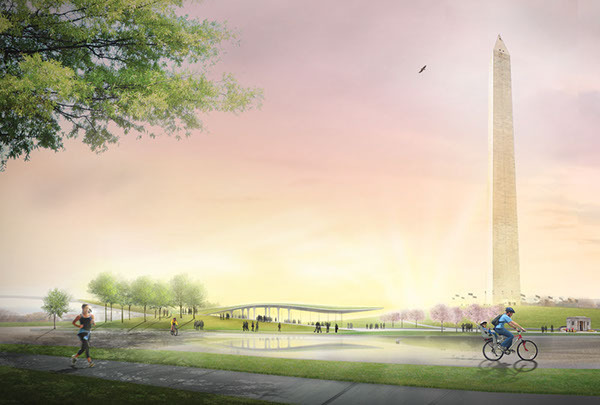 WEISS/MANFREDI + OLIN have been selected as the winner of the National Mall Design Competition for the Washington Monument Grounds at Sylvan Theater in Washington, DC. 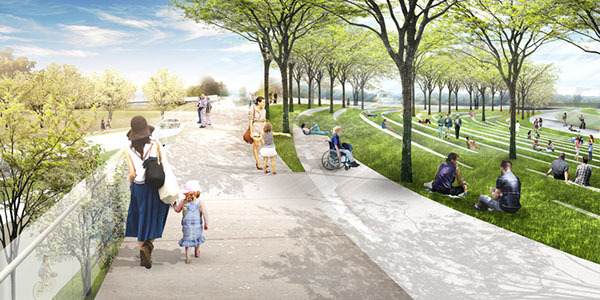 Extending from the heart of the National Mall, a rejuvenated Sylvan Theater and Sylvan Grove will restore the tree canopy that inspired the name of the original theater nearly a century ago. 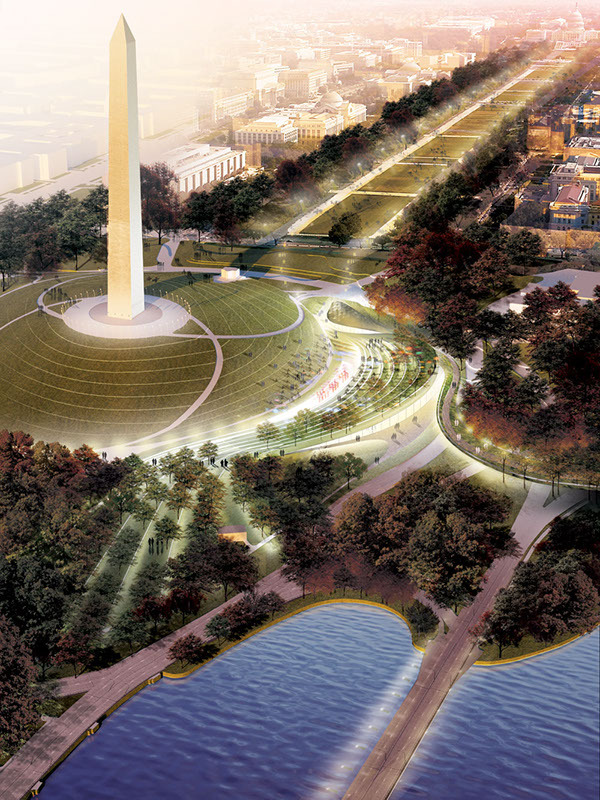 The new grove and terraced lawn will define an amphitheater, where a wide range of performances and events can be seen against the stunning backdrop of the Washington Monument. The uppermost viewing terrace, a tree lined "balcony", continues across the roadway as a pedestrian bridge that crosses traffic and descends to the water's edge, linking the Mall to the Tidal Basin. An integral part of the grove is the Sylvan Pavilion, visible from the Mall, the Metro, and 15th Street. The Pavilion provides an all-weather café, bookstore, and multi-use destination for residents and visitors to the Mall. A new Ranger Station and information / exhibition center on Independence Avenue frame an arrival plaza for tour groups. The project reinvigorates the Monument Grounds with new landscapes of performance, clarifies the visual connections between the White House, the Washington Monument, and the Jefferson Memorial, provides new physical connections between the cultural landscape of the Mall and the Tidal Basin, and most importantly, creates a transformed setting for our nation's most visible center stage. 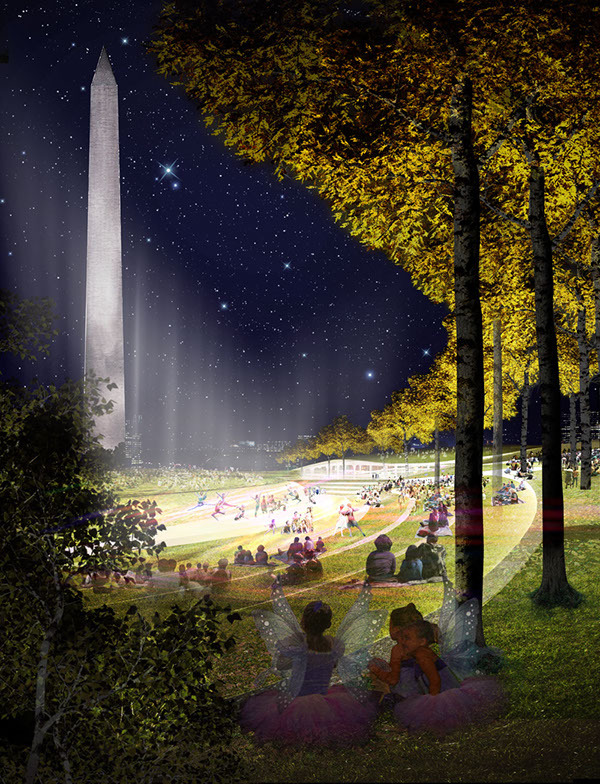 WEISS/MANFREDI + OLIN have been selected as the winner of the National Mall Design Competition for the Washington Monument Grounds at Sylvan Theater in Washington, DC. 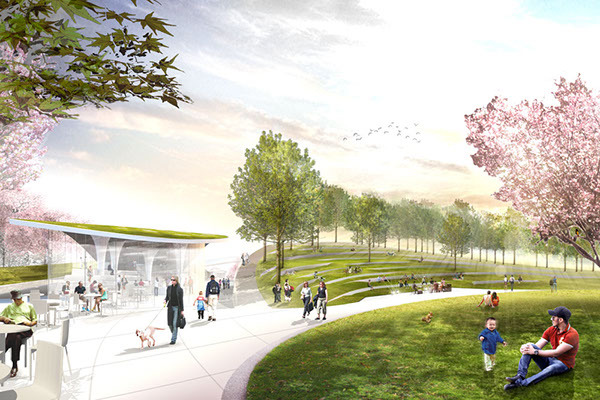 "Our vision for the Sylvan Theater at the Washington Monument Grounds elevates the performing arts, literally and figuratively, with a new amphitheater land form shaded by a canopy of trees that affirms this site as our nation's center stage. 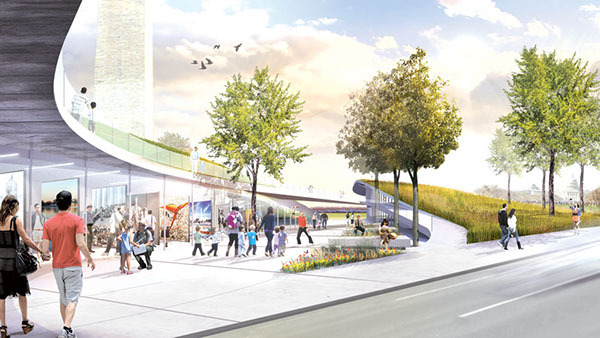 We turn the audience's sights to both the obelisk and the arts and restore lost connections between the Mall and Tidal Basin with a sinuous land bridge." Marion Weiss and Michael Manfredi Extending from the heart of the National Mall, a rejuvenated Sylvan Theater and Sylvan Grove will restore the tree canopy that inspired the name of the original theater nearly a century ago. 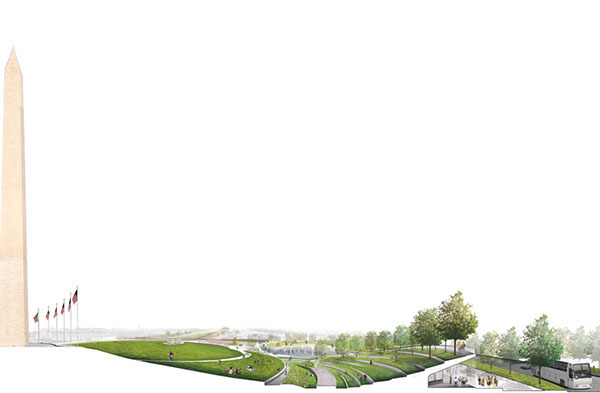 The new grove and terraced lawn will define an amphitheater, where a wide range of performances and events can be seen against the stunning backdrop of the Washington Monument. The uppermost viewing terrace, a tree lined "balcony", continues across the roadway as a pedestrian bridge that crosses traffic and descends to the water's edge, linking the Mall to the Tidal Basin. An integral part of the grove is the Sylvan Pavilion, visible from the Mall, the Metro, and 15th Street. 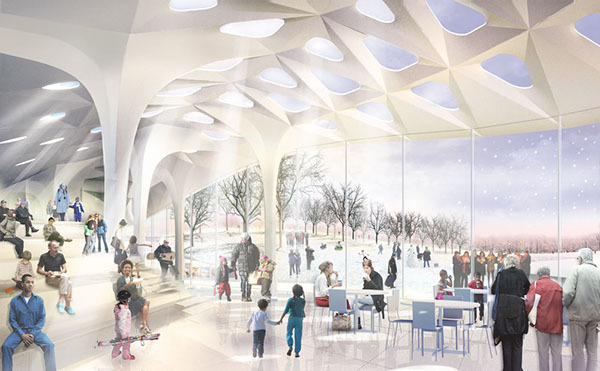 The Pavilion provides an all-weather café, bookstore, and multi-use destination for residents and visitors to the Mall. A new Ranger Station and information / exhibition center on Independence Avenue frame an arrival plaza for tour groups. The project reinvigorates the Monument Grounds with new landscapes of performance, clarifies the visual connections between the White House, the Washington Monument, and the Jefferson Memorial, provides new physical connections between the cultural landscape of the Mall and the Tidal Basin, and most importantly, creates a transformed setting for our nation's most visible center stage.